Horizontalpitch: First of all, tell us a little bit about Jericho. What is Jericho and how long have you been active with this moniker? Jericho: My real name is Sebastian Steininger. I’m from Nuremberg, southern Germany. There is no fancy story behind my artist name Jericho. If I remember right, I woke up one day, had this name in my mind and stuck to it for almost 18 years. HP: What’s your musical background, when and how did you realise that you wanted to make electronic music? J: My musical journey and fascination for electronic music started during the mid-1990s when I discovered bands like Chemical Brothers, Massive Attack or The Prodigy. End of the 1990s Drum&Bass grabbed my attention and I decided to create my own music. Quite active as DJ and producer with a couple of releases I became part of the rising Drum&Bass scene in Germany. Over the years I enjoyed making slower and organic sounding music more and more. I added a guitar, a banjo and some guitar pedals to my arsenal. Early 2015 I discovered the Eurorack format by watching a guy on Youtube twisting knobs on a Make Noise Phonogene module. One week later the first case was ready to be filled and my modular journey started. HP: Let’s talk about the process, how did you use the modular for this track? Is your approach more gestural and inspired by the moment, or do you plan things ahead and then try to (re)create them on the machine in a programmatic way? J: Seahorse Lullaby is part of a 4-track EP called “Modular Diary” released on Infiltrator Records. The idea of a Modular Diary was born when I decided to capture my modular compositions and experiments. For this track I started with a little music box melody which was created in the DAW. The recording gets processed with the Qu-bit Nebulae sampler. I like how the Nebulae is treating the original sound source. It adds this certain tape-like and lofi character to almost everything. By manipulating the start and end point of the loop with envelopes and random control voltages, I came up with this endlessly evolving melody. I’ve added even more random quantized voices with the Mutable Instruments Braids and the Intellijel Shapeshifter to give the melody more tension and variety. I start patching like this quite often. I call it ‘controlled randomness’. Once this environment is set up, I’m adding more static layers. This allows me to perform and evolve the idea without loosing the main structure of the patch. Now the fun part begins. Modules like the Pressure Points, attenuators and filters with big knobs are great for injecting controlled changes to the patch. You can’t predict and control everything during the recording. There’s too many variables, which are influencing each other. These ‘happy’ and unpredictable accidents are often the most interesting parts after hitting the stop button. HP: There is a certain bright and uplifting mood in your tracks, but you don’t resort to easy melodies or other more conventional musical devices. What’s your approach to composing music for the modular synth? J: I like how you describe the mood in my tracks. Most of the time it is this kind of duality between darkness and brightness which I want to express with my music. It’s a complex inner feeling which can’t be resolved by too ‘easy’ melodies. Composing music with a modular synth gave me opportunity to break out of the typical loop-based composition of a DAW. There are dozens of unfinished snippets from my pre-modular era. Probably I’m bored too fast when it comes to the arrangement with a computer. 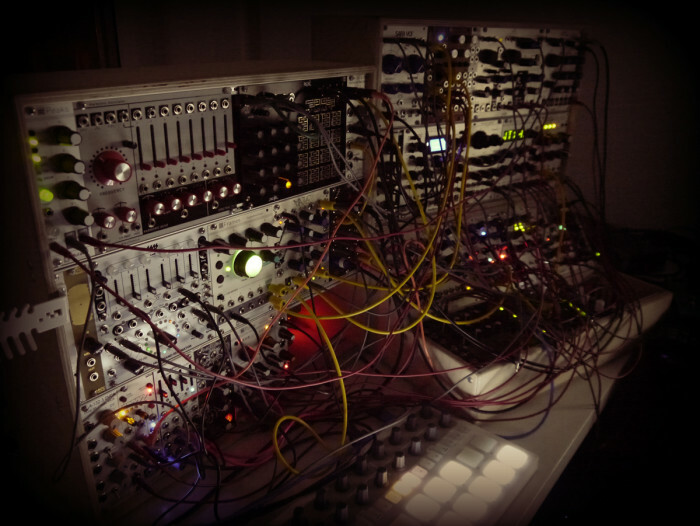 Working with a modular synth combines all this in a musical way. There is no clear red line between designing a sound and putting it into context with other voices in my patches. What I really enjoy is the way the modular forces me to focus more on hearing than on watching a computer screen and trying to translate that to what I’m actually hearing. There can be so much detail in a single sound, if you listen carefully. Jericho’s system. Courtesy of Jericho. HP: When making music, do you regard the modular more as an instrument that you play or as a sound-design machine? What makes more sense to you, “less is more”, or “just give me that wall of modules”? J: It’s both. For me the beauty of modular relies in the interaction and non-linearity. Not only between me and the instrument, but also between all those modules and ideas. In a computer-based DAW, every track remains isolated. Of course you can create musical and timed relations on the time axis. It will be still linear and might sound digitally quantized unless you put a lot of work into automations. One of my biggest ‘aha’ moments, when I started with modular synthesis, was the realisation of dividing trigger signals from pitch information. The concept of midi composition for example: if you hit a certain key you will hear that tone for the time you are holding the key down (apart from envelopes). This concept was burned in my head for so long. Going Modular opened a whole new field of creativity for me. When I started back in 2015, I expanded quite quickly to 12U. Now I’m at 21U, I have stopped adding more rows and have entered the bazar at Muffwiggler’s and Facebook. There are so many modules in my system which still need to be fully discovered. I think a lot of people who started with modular are going this route. You need to get used to what you have in order to know what really is needed for achieving your sound. HP: Do you perform these tracks live as well, and if so, how do you approach a live set with the modular? J: All my modular-based tracks are live multi-track recordings. The drums are usually made inside the DAW. The performance of the recording is always live and a mixture of mainly modular and some DAW-based sounds. Currently I’m planning a mobile setup for live sets outside the studio environment. HP: Plans for the future? Are you working on a new album/EP? J: I do avoid making too big plans at the moment and will continue with the idea of my Modular Diary. Collaborating with other musicians in a live context however would be something I’m really interested in.